Two years ago I posted a recipe for “Crusty Bread“, “No-Knead Bread”, “Artisan Bread”…whatever you want to call it. It has been the most popular recipe on my blog. I have received over 2.6 MILLION page views on this recipe alone (thank you Pinterest). Let me clarify that the recipe originated with Jim Lahey of Sullivan Street Bakery. Please do not send me a comment stating that I make it appear to be my brain child. I’m not. I’m just helping everyone through the process. I have received THOUSANDS of questions and responses to this recipe. I have received helpful hints on how to clean my pots, which are sparkling at the moment. Thank you very much. Many of you have sent in your fabulous creations. From classy fig, walnut, and bleu cheese to less classy pepperoni and sausage. I have had more fun reading about how successful bread baking experiences. I have scratched my head over questions that completely puzzle me. Oh how I wish I could just pop into a few kitchens to help solve a dilemma. I have answered the same stickin’ questions OVER and OVER again. I have literally answered some questions HUNDREDS of times! I have to admit I don’t mind. Keep them coming. I love hearing from you. I would like to go over this simple recipe once again. Be chill. It’s only yeast. It won’t hurt you. Just follow the instructions the best you can. Play in your kitchen and play with your food. Especially this bread. CREATE! 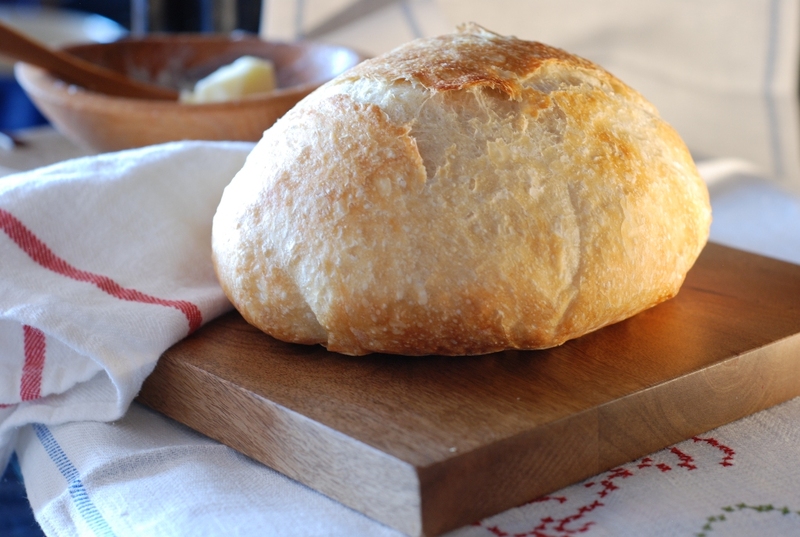 The base of this bread recipe calls for 4 simple ingredients. Simple. Don’t complicate the ingredients. If you can find this product, buy it. It’s fabulous yeast. My local grocery store carries it. If you can’t find it you can order from King Arthur Flour for $5.95. 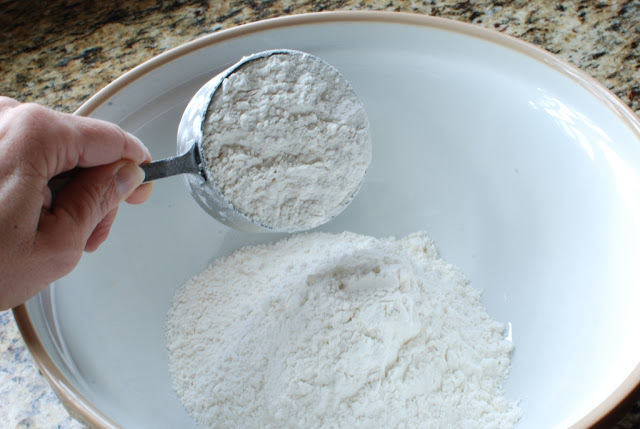 In a large mixing bowl add 3 cups all-purpose flour. I always use unbleached flour. I just do. If all you have is bleached flour, then use it. If you have bread flour, use it. It actually works well in this recipe. Remember this is a VERY forgiving recipe. 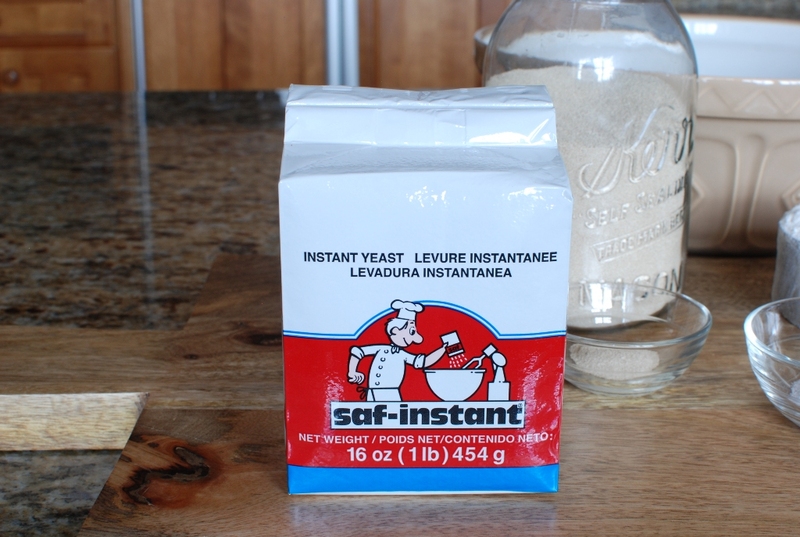 Add 1/2 teaspoon instant yeast. IF you do not have instant or Rapid-rise and you only have regular active dry yeast, THEN proof the yeast before you use it by mixing the yeast with 1/4 cup warm water. 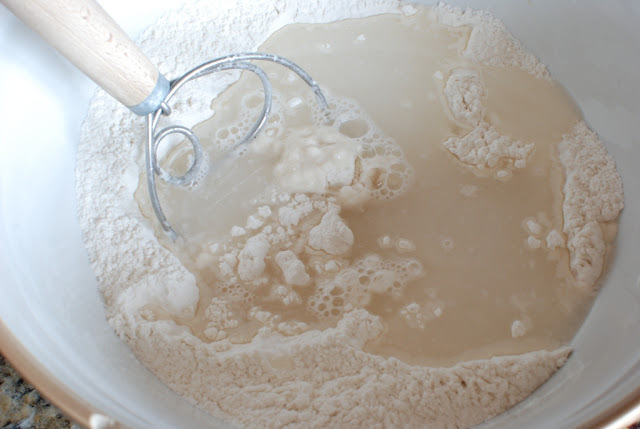 Let it set for 5 minutes then mix the yeast in with the water. BAM! It will work. Add 1 3/4 teaspoon kosher salt. If you only have table salt, you may want to reduce the amount of salt by 1/4 – 1/2 teaspoon. Pour in 1 1/2 cups water. You don’t need to stress over the temperature. I just turn on the tap and use whatever comes out. 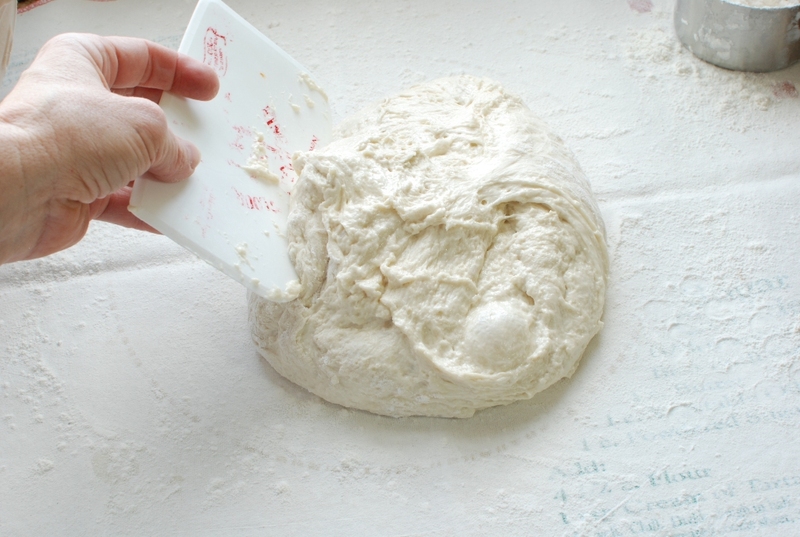 You can use a wooden spoon, rubber spatula, whatever you have to mix the dough. Don’t over mix. Remember it’s “NO-knead”. Let the dough sit for 12-18 hours. 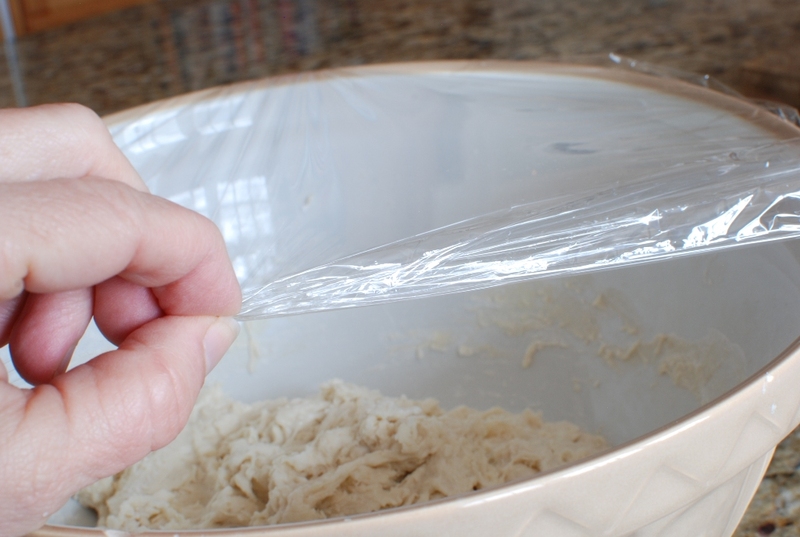 If the dough only sits for 11 hours, it’s ok. Don’t sweat the fact that it needs another hour. 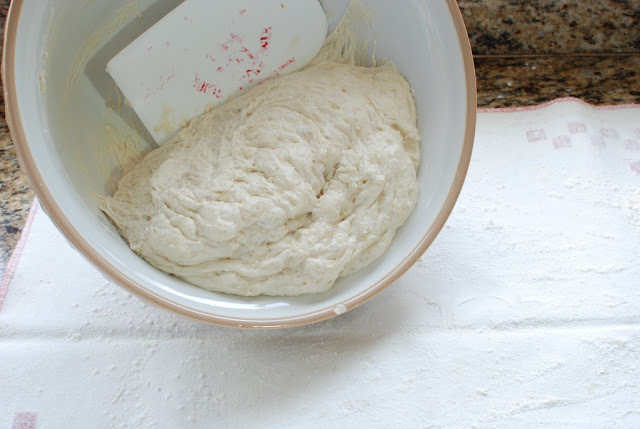 If the dough sits for 24 hours, it’s ok. Don’t stress. It will all be good in the end. I made this dough at 4:00 p.m. I covered it and let it sit overnight. I went to a lower body workout, then ran up hill for 6.6 miles, made a smoothie, showered, put on my makeup, dried my hair and threw in a load of wash. I finally got around to making the bread at 11:00ish. It was rising for 19 – 20 hours. It’s all good. The bread will be awesome. 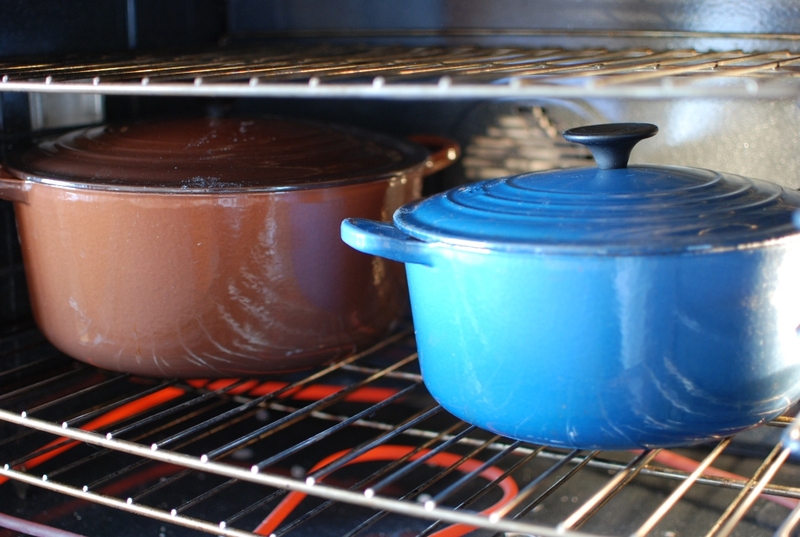 RIGHT NOW: Heat your oven to 450 degrees F.
You do not HAVE to have a enamel coated cast iron pot. They are awesome and I can’t live without mine, but it’s not completely necessary. As you can see anything that can take the heat that has a lid or is tightly covered will work. The idea is to create a steam oven inside the pan. The steam is what produces a nice crisp crust. What ever the container is that you use, just make sure it can take temperatures up to 450 degrees F. I have some Emile Henry covered dishes, but they don’t like an oven hotter than 400 degrees. They will crackle like crazy if you put them in a 450 degree oven (experience). Oh! Your pot will need to be hold at least 3 quarts. 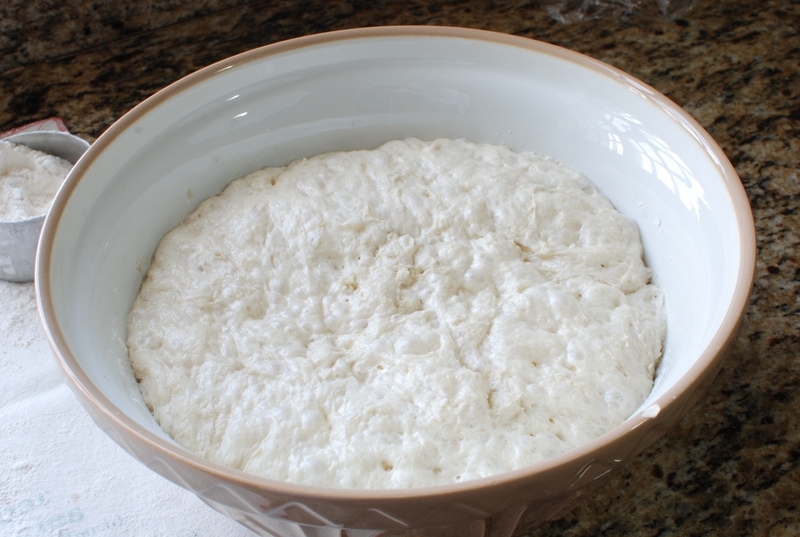 5 – 6 quarts is ideal, but the smaller will work, just be careful not to burn yourself putting the bread in or removing it. I received at least 500 questions about the size of my pots. I hope I answered that question well enough. Note: the dough is super sticky. Heavily flour a surface. I’m using a pastry cloth, which is nothing more than canvas with the edges surged. 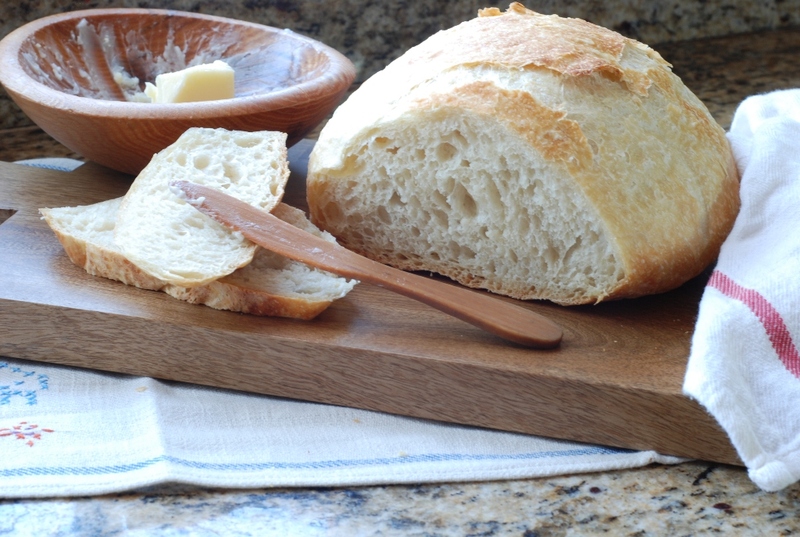 You can use your counter top, a bread board, whatever works. Just flour the daylights out of it. If you have a dough scraper, use it. IMPORTANT: Do NOT knead the bread. Remember it’s “NO-knead”. 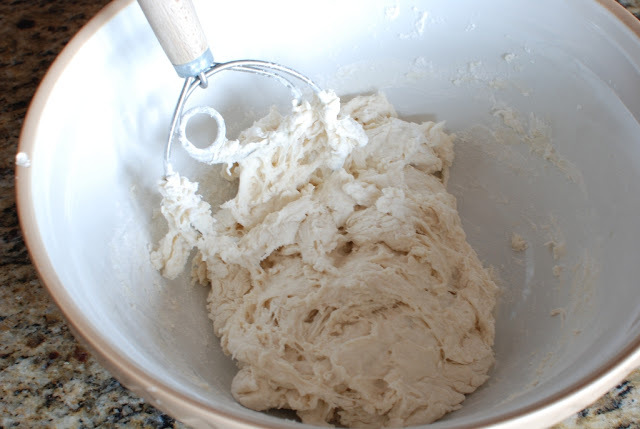 Gently form the sticky mass of dough into a round ball. Look closely at the dough and you will be able to see a large air bubble in the lower right side of the dough. That’s good. I don’t want to knead out the large air holes. We are making artisan bread and want many large air holes. 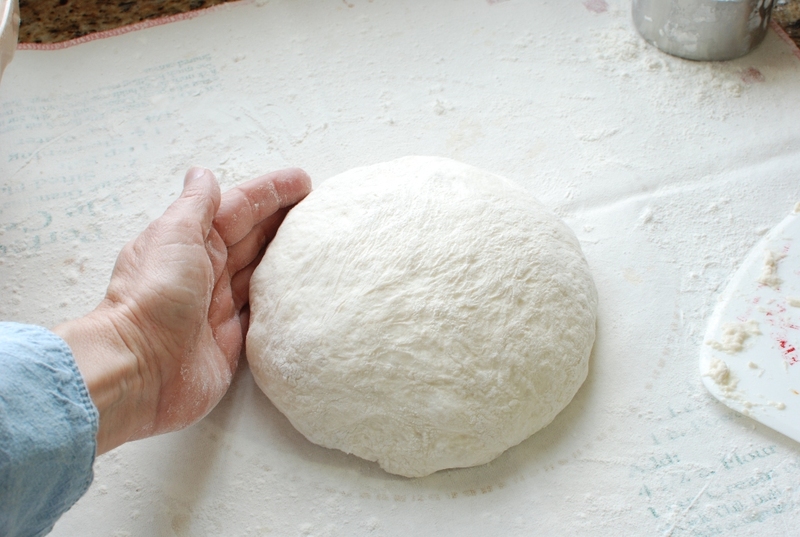 Flour the heck out of your hands and gently smooth the dough. Just to make life easier, I am placing the dough onto a sheet of parchment paper. 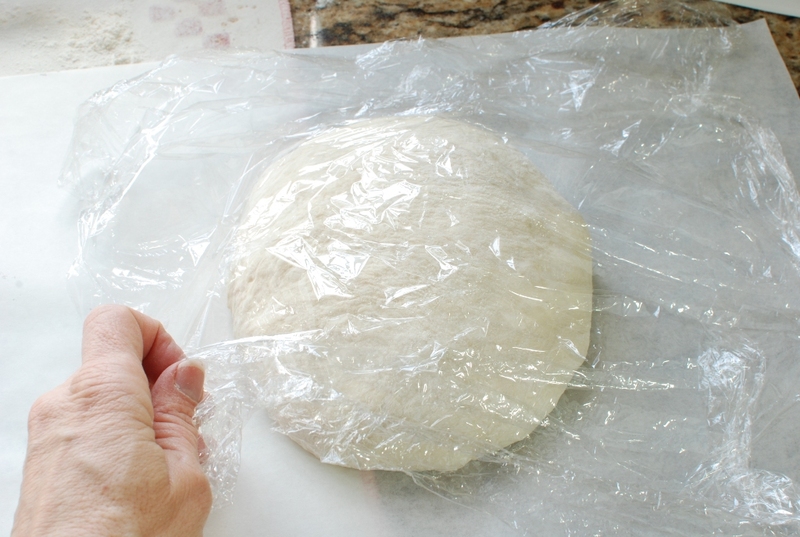 This parchment paper makes it easier to lift the dough in and out of the pot. Cover with plastic wrap and let sit while the pots are heating for 30 minutes. After 30 minutes carefully place the dough into the preheated pot. Place the lid on the pot. Remember we are creating a steam oven. If you are using aluminum foil, crimp it around the edges as tight as you can. Please don’t burn yourself. I know what you are thinking. If I don’t use parchment paper, do I need to grease or oil the pan. NO! NO! I have never had the bread stick to the enamel covered pot. Oil or grease in this hot pot will smoke like crazy. If you are worried about the dough sticking, invest in parchment paper. After 30 minutes remove the lid. Ta da! Isn’t that just amazing. It’s so pretty I get all giddy inside. Bake an additional 15 minutes with the lid OFF. 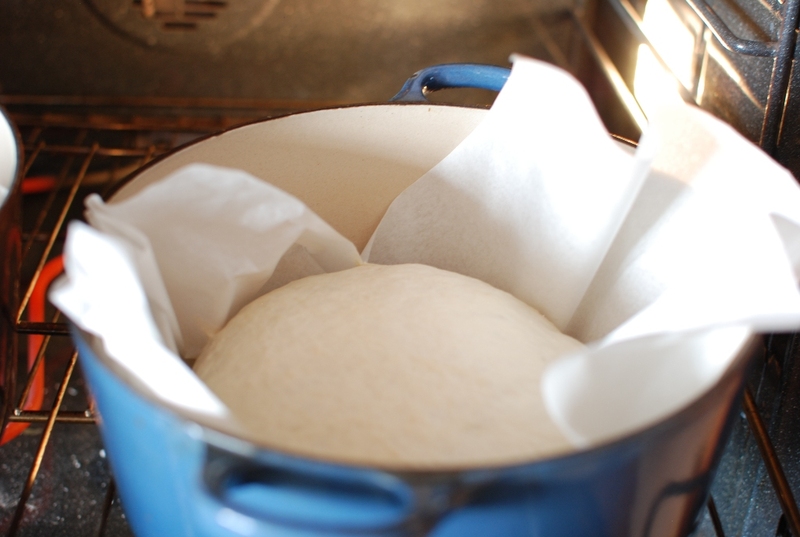 After 15 minutes, remove the pot from the oven and place the bread on a cooling rack. Chances are you are going to be cutting into the bread immediately. I did. Why not. It’s amazing. If you have the will power to let it sit until it’s cool, it will be much easier to cut. Who cares? The bread is amazing right out of the oven. You did it. Pat yourself on the back. You are one amazing bread baker. 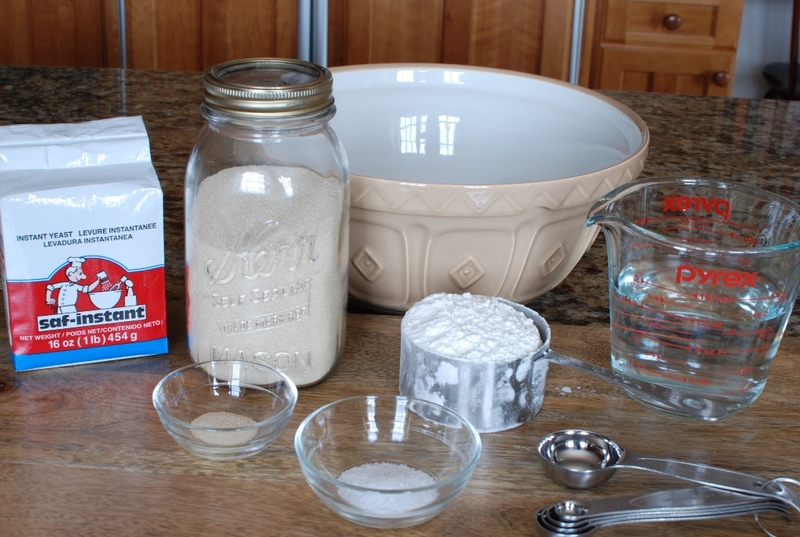 Now you can start creating my mixing wonderful flavors into the dough. The sky is the limit. I will be posting a few ideas during the next few days. Learn to make this crusty artisan bread, and then you can add any flavors and mixins your heart desires. 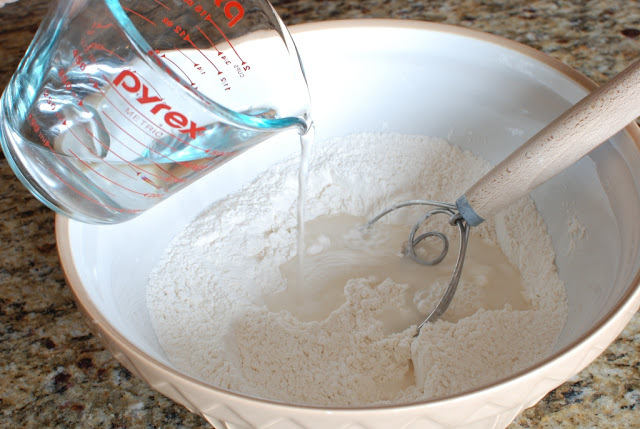 In a large mixing bowl, whisk together flour, salt and yeast. Add water and mix until a shaggy mixture forms. Cover bowl with plastic wrap and set aside for 12 - 18 hours. Overnight works great. For many of the answers click on the following: Beware there are thousands of posts. The best way to get a quick answer to a question is to use the “contact me” at the top of the page. Stay posted for more bread ideas. I love this bread, but i have a terrible time SlIcing it because thE top and bottom crests are so hard. Once i finally break through the top crusT, the middle is fine, and then i have to “saw” the bottom crust, too. It is very moist so i donT think im over cooking it. Suggestions? Hi Carol, A gummy interior can be a problem for sure. Try adding 1/4 cup MORE flour and bake 5 minutes longer with the lid on and cooling completely before slicing. This might help. Sometimes the crust can be hard to get through. Try putting your pot in the oven when you first turn it on. As soon as the oven temp reaches 450 drop the dough in at that point and bake according to directions. To clarify don’t preheat oven to 450 and THEN put the pot in the oven for 30 minutes to preheat. Let me know if this doesn’t work. check it out. I’m definiteely loving the information. and if i use bread flour, do i need to add more water? i’m afraid the consistency of the dough will be differrnt? 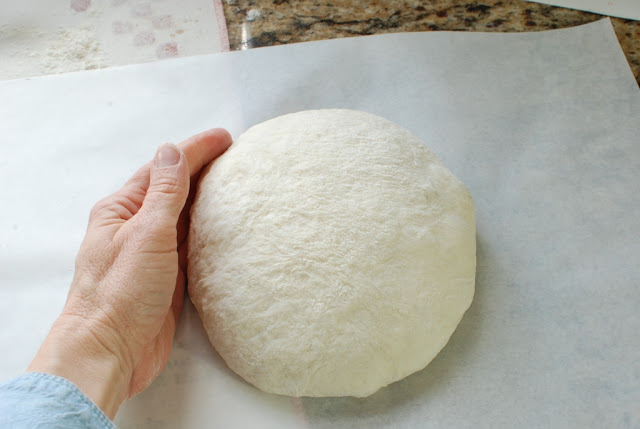 if i make it into roll, will it be soft, tender, light ordinary knead bread/roll/buns? or it will havr crust outside of the bread? Can i make this into dinner roll and bake it in 8″ pan? This has become a traditional part of all family holiday meals. I also take it as hostess gifts. I usually do a savory bread with nuts, parmesan lemon zest and chopped fresh rosemary. Today I added chopped roasted garlic, CHOPPED roasted walnuts, pepitas, grated parmesan, a bit of lemon juice. I will sprinkle the top with flour and some pepita before baking. I have even had people order loaves from me at work! I think I will try adding kalamata olives next time :). Thanks again for sharing this fabulous recipe, people are always so impressed!! i am a long time bread maker, i have made many different kinds, from my grand mother, mother and mother in law. this recipe which i have used now for many, many bakingS, is by far the easiest bread to make and never fails to turn out perfectly. the crust is outstanding and the crumb is perfect. i recommend everyone try this, you will never ever buy a loaf of bread for $3.00 again, it is so simple and SO IN EXPENSIVE AND THE NICE PART IS does not mess up the entire kitchen with flour dust and keeps well in the freezer. i have shared this with many people and they think it is OUTSTANDING. Yep, it’s a keeper. Thank you so much for your positive feed back. I followed the recipe directions spot on. I did this three times. When the 18 hours is up, I can literally pour my dough out of the bowl. Changed yeast, changed flour. I couldn’t form this into a ball if I was Mandrake. 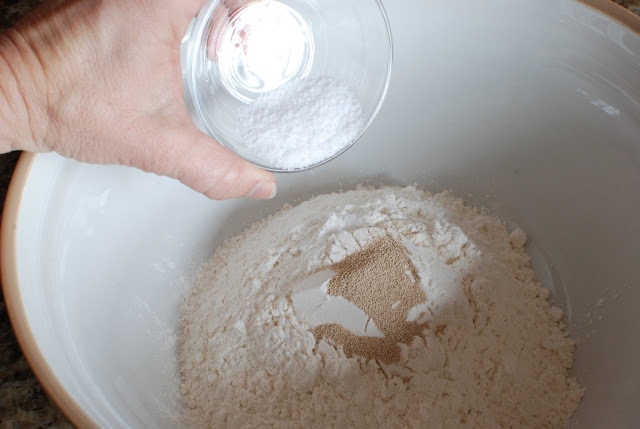 Try adding 1/4 cup more flour. If the dough is still too wet, add an additional 2 tbls. But the 1/4 cup should do the trick. Thanx Janet, I’ll try it. i love this recipe! I made it twice last year around christmas time and now twice in the past month and we love it. It’a So nice and crusty but has always seemed a luttle doughy in the center and i’m Just wondering if others have noticed this or if i am doing something wrong. I think my oven is a little hotter than it should be so perhaps i should bake it at a lower temp for a longer time. Also, does your parchment paper get relly brown and burnt looking? Any advice would be appreciated and thank you so much for the recipe and the video. Hi Mary Jane, Try baking the bread longer with the lid ON. I think this helps a lot. You could, also, try adding 2 tablespoons more flour, lowering your oven temp by 25F degrees and baking a little longer with the lid on. I Think this helps. Thank you soooo much for this recipe! IT’S so easy that when i made it the other day, it came out perfectly even though I’ve never attempted to make bread before in my life. I wanted to make it more of a herb crusted loaf, so I mixed some olive oil with herbs, brushed it on the loaf, and sprinkled some coarse salt on top. It was a huge hit with my neighbours and husband, they absolutely loved it. This is now my go-to bread recipe! I currently have 3 more batches rising in my kitchen to bake TOMORROW ? Thank you so much for sending me your success story and another great idea for heab crusted loaf. Welcome to the obsession. in your pictures there are two loaves in two pots but in your instructions it doesn’t say to divide the dough in two and put in two pots. is this something you didn’t mention or did you double the recipe. Sorry for the confusion. I was actually baking a loaf of cheddar bread at the same time I took the photo. I wanted to bake them together so I didn’t have to keep my oven on for another baking. The recipe makes just one loaf. However, you can easily double the dough and split it in half for two loaves. Thank you. I figured it out though once the dough ball was ready to put in the oven. Hello, I used for my no-knead-bread from Tupperware UltraPro dishes. They have a lid so they bake very well. Thank you, thank you, thank you☺️ This is the most amazing bread that has turned out fabulously each time of baking. It's a huge hit with family and will be my go to recipe in future. Grateful for you sharing this ?? Thank you so much for this amazing bread recipe����It's the best artisan bread I've ever had and it's increadible to be able to cook it at home. Again thank you. I am putting my loaves into the oven momentarily, Merry Christmas everyone!! This bread is a standard fare at all of my family holiday meals now, so good everyone goes nuts over it!! I have found beautiful cast iron dutch ovens at thrift stores for as little as $8-$10. TJ Maxx has them for half of regular retail if you want new. You can't miss with this bread, it's AMAZING!! Thank you!! I made this a few months ago, and forgot to come back to comment. Loved this bread. Lovely and simple! Excellent recipe. I used regular dry yeast and 4 different kinds of flour + some bran. Thank you so much for taking your time sharing the recipe with us. Love your writing style too! The dough came out smelling delicious, so I know the yeast was working. My problem is trying to work with the dough after it was on the heavily floured surface. No matter how much I floured the surface and my hands, I could not get it to form into a ball. My natural instinct was to start kneading it was the bench scraper, but I can't do it with this recipe. How did everybody else manage to make this work? Also, adding feta cheese (kinda crushed up with your hands) and cut up sun dried tomatoes, a little bit of oregano and about 3 tbsp olive oil, will give this (perfect as is!) recipe,a great tasting twist! 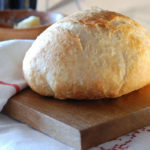 BY FAR, THE MOST PERFECT BREAD RECIPE!!! The things you can add to it are endkess. My favorite is: Add a couple of handfuls of brown, lightly packed sugar, 1 tbs (or a bit more!) cinammon, 1/2 tbsp melted butter . WAfter the first rise, when you pour it in the floured surface, add in a handful of raisins and simply fold them in. Follow the rest of the recipe as is. You have just created a super delicious raisin bread, which is quite popular for breakfast here in Greece!!! 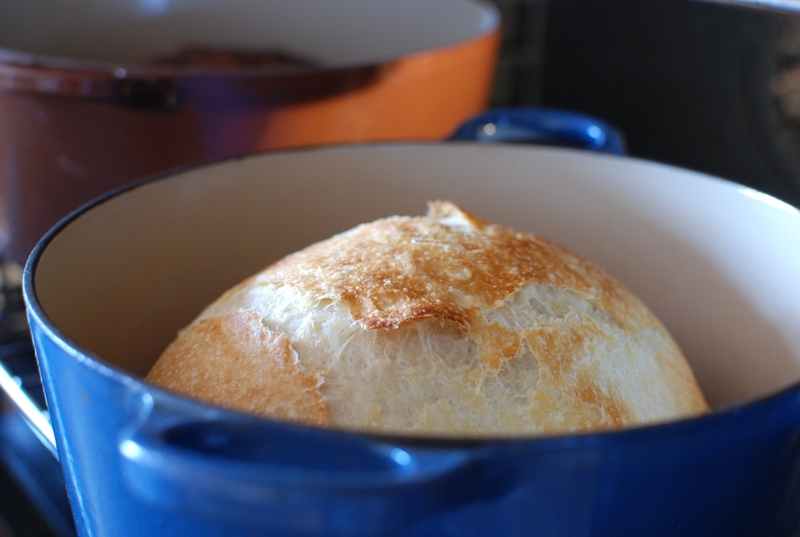 I have made this recipe so many times in a covered iron dutch oven. It comes out perfectly every time. I don't even have to use parchment paper. It never sticks. Great recipe! Yay, I have just baked this bread (in my slow cooker insert with tin foil) and it has turned out perfectly. I will be experimenting next time with different flour/herbs etc. Also a perfect bread for my Mum who has trouble with her hands. Kneading is too much for her. I will pass this recipe on. Thank you all the way from New Zealand! This bread is amazing! It rivals any great, crusty French bread that I've eaten in France. Sometimes I add Rosemary or oil cured chopped black olives to it. Today I'm going to add garlic. It is so delicious! It's best right out of the oven or toasted in my opinion. Dear Anon: I'm sorry you are having problems with sticky dough. Try adding 1/4-1/2 cup more flour to the recipe. I find this helps solve most sticky dough problems. Proceed as per recipe. You can do this! It never seems to work. Dough too sticky, even when I use a lot less water. It does not hold a ball shape, and then bakes to a hard, flat, airless lump. It's certianly NOT foolproof – with baking, there are too many variables to claim this. 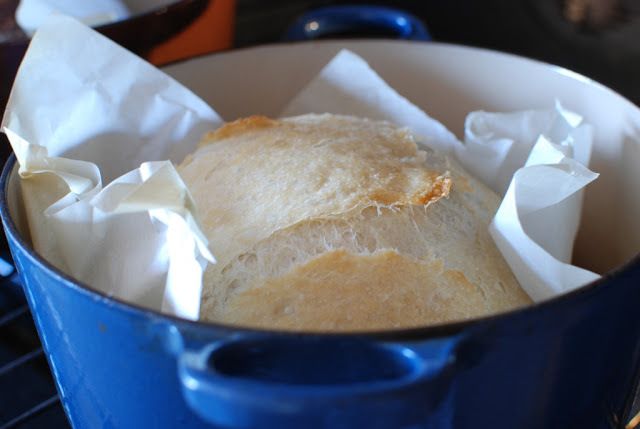 I really liked the run-down and tone of this recipe… and gave it a try over the weekend with very favorable results… I was excited to finally be able to make some homemade bread that actually worked! Only difference in my approach is that I used a cast-iron dutch over which I think may have cooked the bread faster as by the time it came to remove the lid for the final 15 mins, it looked as if the bread was done already based on the pics you provide in your recipe. Either way, this is a super easy recipe with great results!! I made this bread and my family was competing for the last piece of the loaf. Thank you for such a beautiful recipe!! 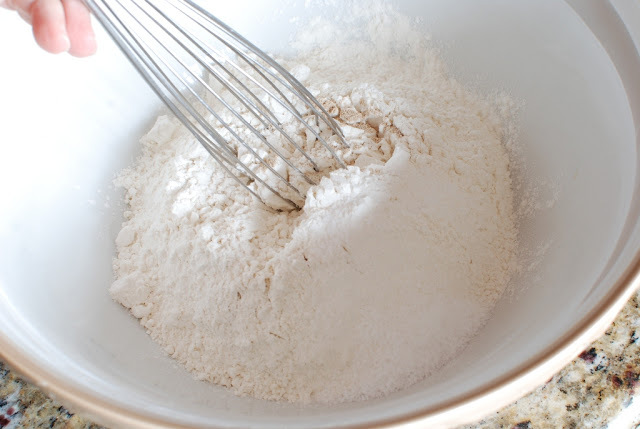 If the dough seems too wet you can always add 1/4 cup more flour at the beginning. The bread will be easier to shape and will still bake beautifully. I've made this 4-5 times, it's always wetter than yours…no, I do not bloom my yeast so no, I don't add extra water…BUT, even though it's wetter, it turns out amazingly delicious. I use cast aluminum pots, and I do use the parchment paper, it's way too wet to pick up with bare hands. Oh, and I don't flour it, I use cornmeal. This is the best bread I've made. I added fresh jalapeño and sharp cheddar and it was perfect and gone in 60 seconds! Tonight trying roasted garlic. I was worried at first as the dough was so sticky, but patience and flour were a virtue. Thanks for sharing this recipe. I'm never going to pay 6 plus dollars a loaf for artisan bread again! I've been making this bread for about a year now and absolutely loving it! But lately, when making the dough is very chunky. It has little chunks of hard dough in it. It normally tastes fine, but doesn't look appealing because I can't get the little chunks out. The dough isn't as bubbly/sticky as it is in the tutorial, anymore. Does anyone know why that might be? Thanks! Mom2ec Thank you for your fun comment. I'm so happy to hear your son is baking bread. My son became a college room mate favorite because he baked fresh bread daily for his apartment. Thank you for this bread recipe. I think I have got the hang of it now! My son loves it so much, he wants me to teach him how to make it so he can have homemade bread while away at college! We now make a double loaf, and it is usually gone within 24 hours! This makes the best toast as well (if you have the patience to wait for it)! I must say this is the closest bread to my grandmother's homemade bread I have had since she has passed away. No one seems to be able to duplicate it. I am so happy with this recipe. Thanks so much! Hi Warren, Yes you can bake at 225 celsius. Just bake an additional 5 minutes with the lid on before you take the it off. Hi Janet I have never tried a no knead bread recipe before and I am about to give yours a whirl. However the highest setting on my oven is 225 degrees celsius. Should I alter your covered and uncovered baking times? I've read through a lot of the comments and questions trying to find an answer to my problem. Like many others, my dough was flat and almost runny coming out of the bowl. It never did ball up. 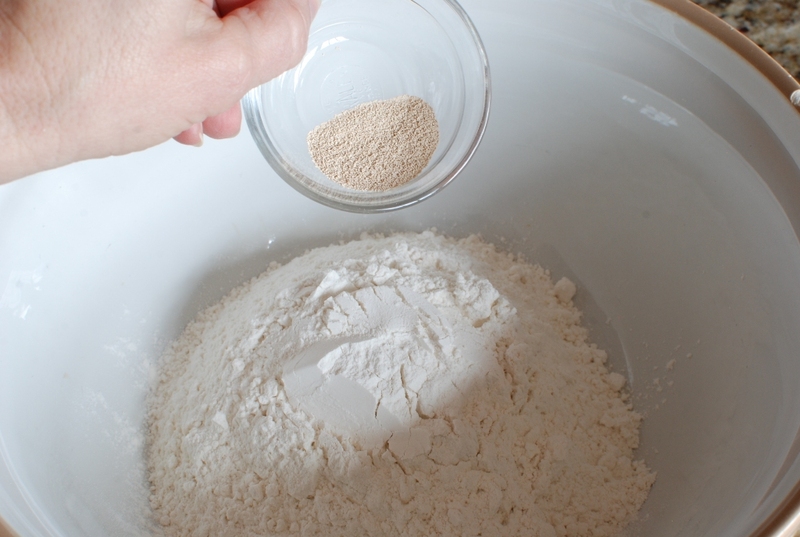 I sifted my flour before measuring it. Was that my problem? Too much water and not enough flour? I baked it, but the loaf was flat and doughy and really moist in the middle. Thank you so much for the link back. You have a great tutorial and I love your revisions and tips.